According to the Wall Street Journal, “a new study finds that, in 42% of companies, low performers actually report being more engaged – more motivated and more likely to enjoy working at their organization, for example – than middle and high performers do.” In other words, people who spend their workday on Facebook/playing Tetris/knitting a sweater (and yet never one for you) are pretty pleased with themselves. I would just like to editorialize at this point and add that I’m pretty sure these people are total a**holes. Apparently, according the aforementioned study, these are people who aren’t exactly made of motivation and hot sauce, so they tend to have jobs that don’t require much effort or f*ck-giving. Meanwhile, people who are into their time-and-energy-consuming jobs end up staying late and cleaning up the messes that the lazy jerks left, getting home after 8 and totally missing the Girl Scout Cookie truck again, and are probably really upset because if they live in New York, it’s their best bet and it reeeeeeeally doesn’t come around very often. There is a hole in their heart where thin mints should be. In an earth shattering discovery, the study has shown that employees who spend all day doing anything except work are happy, and employees who have to stay late to re-format spreadsheets (which isn’t even their job but whatever) are cranky. The social science community’s mind is blown. Meanwhile, there are still people who think gay marriage is poisoning their water with terrorist poop, but let’s talk more about this brilliant new workplace revelation that required a funded study. Priorities! Of course, what this all really means is that people who put in the extra time and energy and get paid in frustration and crankypants end up feeling unappreciated and will start looking for other jobs. 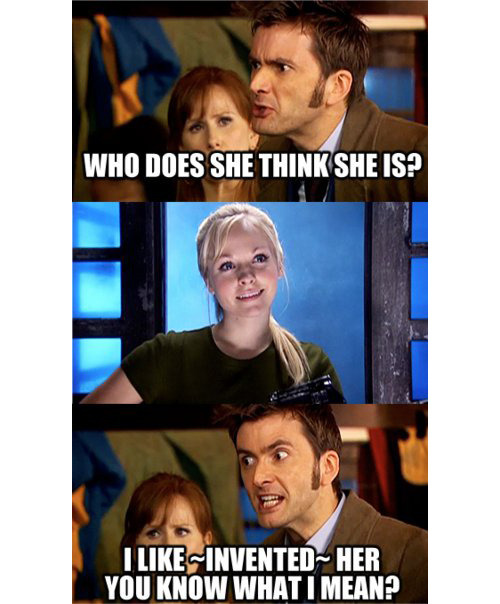 The self-contented idiots, who could at least make some funny Doctor Who/Mean Girls mashup gifs to entertain the rest of us (do middle schoolers have to do everything??? ), will happily stay in their jobs because their self esteem is doing quite well, thank you very much. If you’re a boss-type person, this is not what you want. You want the hard-working people with the skills and the interest to stay, and you want the cookie-thieving gif slackers to GTFO. This approach is called employee management! Look at all the great words we can win at scrabble with. The study also showed that the other 58% of employees were, as logic would expect, “high performers [and] the most engaged, or engagement scores were about equal among the employees.” So the problem really is this 42%, which is barely less than half of the overall (white collar) work force. I’m going to go out on a limb and guess that poor management has something to do with this 42%. Because if you pay attention to your employees, then they won’t be able to duck out early to their underwater basket-weaving seminar while other people work so late that their Sims are all dead by the time they get home. So get it together, bosses of America! On top of being a bad idea, this is just simply unfair. Of course people are going to leave when they feel unappreciated, especially when they’re putting so much into their job that you could not, in your wildest dreams, find a gold star big enough to reward them. And then you’ll be stuck with a bunch of giddy jerks who don’t even deserve one of those little green stars that you get for effort, because no one should get a sticker for spending six consecutive hours on Facebook unless their name Begins with “S” and ends with “heryl Sandberg”.